In 2008 in the United States of America more than 1 out of every 100 adults is behind bars. A report by the Pew Public Safety Performance Project announced that on Jan. 1, 2008, an estimated 2,319,258 adults were in federal and state prisons and local jails. The rate of incarceration in the U.S. is the greatest in the world. Even more alarming is the fact that African Americans comprise over 41 percent of those incarcerated, although in the 2000 Census African Americans were 12 percent of the population. Nearly 1 in 15 Black men are incarcerated. But for Black men aged 20 to 34, a shocking 1 in 9 are imprisoned. The rate for Latino men overall is 1 in 36, and for white men, 1 in 106. While the prison population is mostly male, the number of women is increasing annually, especially African American women in their 30s. Southern states tend to have the highest incarceration rates. Thirty-six states reported an increase in the number of those incarcerated in 2007 over 2006, with a particularly astronomical growth in Florida. The prison population has increased steadily during the last 30 years, but from 1987 to 1999 it tripled, and the rate of incarceration of Black males increased 465 percent. These policies have not decreased or prevented crime nor have they reduced recidivism. What has happened is that states do not have enough tax dollars to fund prisons and other pressing public needs such as health care, education and transportation. Lawmakers are being forced to rethink their punishment of nonviolent offenders. In 1987 the states collectively spent $10.6 billion on their prisons. In 2007 they spent $44 billion, a 315 percent increase. Experts say expanding prisons will accomplish less and cost even more in the future. In order to reduce the prison population while still controlling crime, states want comprehensive sentencing guidelines that allow them to decide who goes to prison and who can be put into community drug treatment programs or short-term residential corrections facilities. The report says states must distinguish between violent and hardened offenders and those who are not. Mandatory minimum sentencing must be modified. The length of prison stays could be reduced with credit for good behavior and completing education and work programs. Before release, prison inmates need support for housing and jobs to prevent recidivism. Pews’ Public Safety Performance Project says its purpose is “to help states advance fiscally sound, data-driven policies and practices in sentencing and corrections that protect public safety, hold offenders accountable and control correction costs.” Unfortunately, the report does not include juvenile incarceration, involving youths under 18 years of age. It does not address the effects of for-profit privatization of prisons and the “prison industrial complex.” It also does not address how prisons have become the new institutions for mentally ill people. No explanation is given for the 465 percent increase in incarceration of Black males starting in the 1980s. Gary Webb documented the crack cocaine explosion in his book “Dark Alliance.” Webb showed that, in its efforts to raise money for the contras in Nicaragua, the CIA engaged two gangs in South Central Los Angeles to manufacture and distribute a new and cheap form of cocaine — crack. Guns were sold to them at below cost. The illegal drugs/guns industry is now embedded in Black communities throughout the United States and the Caribbean. Candidates for public office will not address the devastation this illegal drugs/guns industry continues to cause. A national dialogue about the causes of and solutions for the crime and violence that plagues our cities and towns is needed as part of the 2008 election campaigns. It is not just a problem for African Americans, Latinos and poor whites. It is a moral and spiritual problem for the entire country and world. 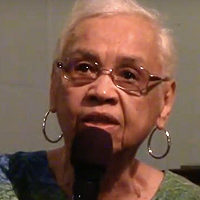 Retired Philadelphia public school teacher Rosita Johnson has devoted her time and energy in organizing material assistance to South African students and teachers before and after the defeat of apartheid.